Inspector Philippa Burk has been with Tasmania Police for 31 years but says she is still as excited about the different experiences and challenges her role brings as the day she first started at he Police Academy. “The camaraderie and support for each other makes this the best place I could imagine to work,” she says, describing her most respected colleagues as “wonderful, talented and qualified”. Philippa says she strives to serve the public to the best of her ability, trying to ensure the best outcomes for all. As a manager she tries to harness the dedication, skills and motivation of her team. She places a strong emphasis on the benefits of mentoring and champions the promotion of women through the ranks. “Tasmania Police is one of the best policing jurisdictions around and I believe that the intelligent, articulate and supportive driving force behind the organisation is at the forefront of this,” Inspector Burk said. Being promoted to the rank of Inspector in 2016 is an achievement she is particularly proud of. She credits her success to hard work, endurance, faith and passion for her work. 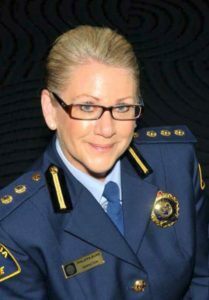 This page -- https://www.police.tas.gov.au/about-us/100-years-women-policing-tasmania-police/profiles/philippa-burk/ -- was last published on January 17, 2018 by the Department of Police, Fire and Emergency Management.